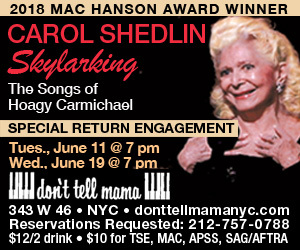 Laura Kenyon recently revived her iconic cabaret creation, June Cool, in June Cool…Alive! at Pangea as the final presentation of the second season of the TWEED TheaterWorks series Happy*Cry*Pretty! This was by far the most theatrical evening of this season’s program, so in some ways it felt as though the prior evenings had been building to this show. It is actually a somewhat abbreviated version of a larger musical following June Cool’s life from young star-struck girl to aging songstress eager to reach a new generation by turning her long-ago-hit LPs into the “new” sensation, CDs. There was a supporting cast of seven who portrayed the men in her life—father, lovers, employers, landlords, record execs, cops, and most delightfully, chorus boys in numerous production numbers. Even when the show veered from delightful musical comedy into moments of surprisingly effective drama, Kenyon and company were so obviously enjoying themselves and having a good time that we couldn’t help but get swept along with them. Kenyon conceived the show and co-wrote the book with composer/lyricist Dennis Deal, who also directed. It has a backstage bio plot that, while managing to hit most of the tried-and-true clichés of a hundred musicals, also managed to make them fresh and specific. The score covered Top Forty radio, Vegas lounge, hip jive, emotional ballads, and humorous specialty numbers, and it was filled with songs that had a wonderfully “lived-in” feel, each one fitting its moment both lyrically and melodically. I’m happy to report that the lyrics proved as accomplished as the melodies. Musical director Ian Herman was a wizard on the piano and an orchestra all on his own, playing each style perfectly. The men in the show played multiple characters, and each had moments to shine—and shine they did, with special mention of Jonathan Pennington as Alan, June’s poetry-writing, finger-snapping, bead-wearing beatnik love interest; he combined hilariously clueless “hipness” with genuine swoon-inducing romance, and his expressive voice was a delightful musical match for the star. Blake Price, in addition to singing and dancing with flair, had some genuinely touching moments as the singer’s long-lost son. And then there was Laura Kenyon! Entering turbaned as a kind of low-rent Norma Desmond, she grabbed the audience with her first note and didn’t let go. She hit just the right tone, whether she was the innocently excited beginner, the woefully under-equipped B-movie star, or the Vegas showstopper. The years have deepened her voice, not only in range but in emotional depth as well. She sells a comedy lyric as well as anyone, and her razor-sharp delivery provided delightful satirical commentary on recognizable genres—but the comment never got in the way of the sensational vocals. When called upon, she let her heart take over in a ballad and hushed the room. I can’t wait to see this piece in a full-blown production, fleshed out with a bit more book and a few more great songs. For now, the intimate space at Pangea gave us a close-up look at what already feels like a hit in the making. There was a genuinely ecstatic ovation at the end, and I wholeheartedly joined in. My heart is full right now – thank you. I would like to say more but I can’t write as beautifully as you. How you experienced the story of June Cool’s journey through the changing decades, her men, her music, the lyrics…you wrote it all so simply and yet with great generosity. Right now I’m going to twirl, skip and jump around with glee…then continue searching for just the right Off Broadway theater for June Cool and her men, which your review has inspired me to do…even more. Thank you for this wonderful review it was a pleasure to be part of this tremendously talented company.